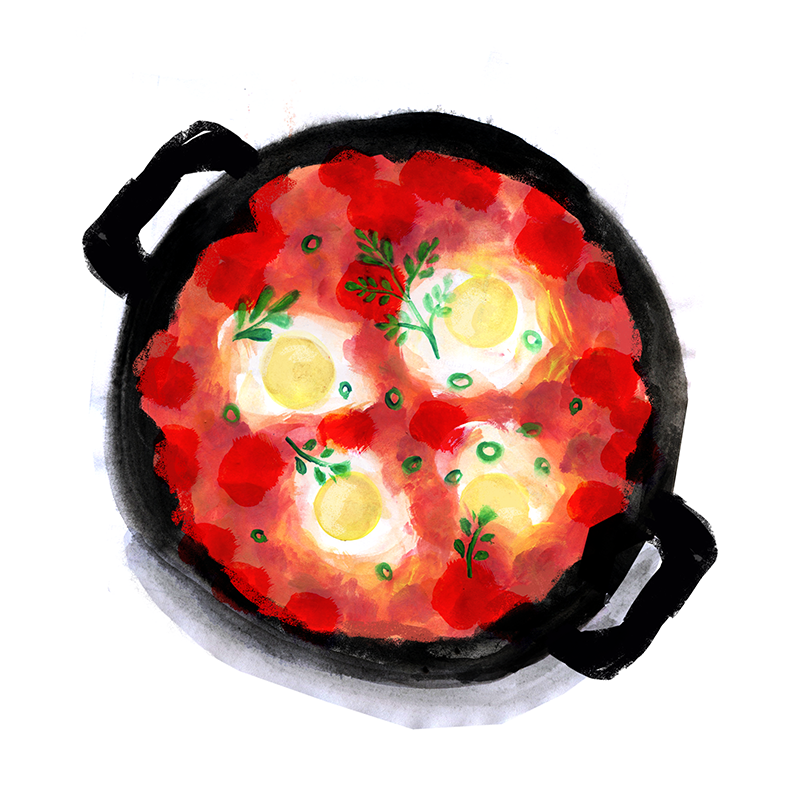 This Israeli breakfast is made with eggs poached in a tomato sauce spiced with cumin, paprika and cayenne. 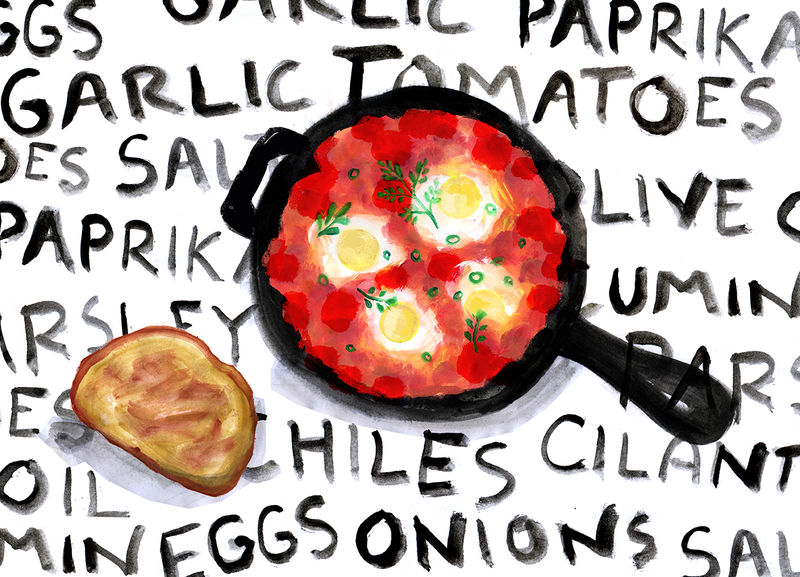 Shakshuka is served right in the same skillet it’s cooked in, making a beautiful presentation. I usually make this without cheese, but you can sprinkle feta or goat cheese on top if you have it lying around. You can also add in any veggies that are in season (like eggplant, spinach, spring onions, etc.). You can add other veggies to the tomato sauce base, such as eggplant, spinach, kale, chiles, etc. Heat oil in a 12-inch skillet over medium-high heat. Add onion and sauté for a few minutes until softened. Add garlic, chili powder, cumin, and paprika, cayenne and cook, stirring frequently, until garlic is soft, about 2 more minutes. If using fresh tomatoes, crush tomatoes with their liquid in a bowl. Add crushed tomatoes or canned tomatoes and their liquid to skillet along with 1/2 cup water. Stir in tomato paste and pinch of sugar. Reduce heat to medium, and simmer, stirring occasionally, until thickened slightly, about 15 minutes. Season with salt and pepper. Crack eggs over tomatoes so that eggs are evenly distributed across the surface. Cover skillet and cook until yolks are just set, about 5 minutes. Using a spoon, baste the whites of the eggs with tomato mixture, being careful not to disturb the yolk. 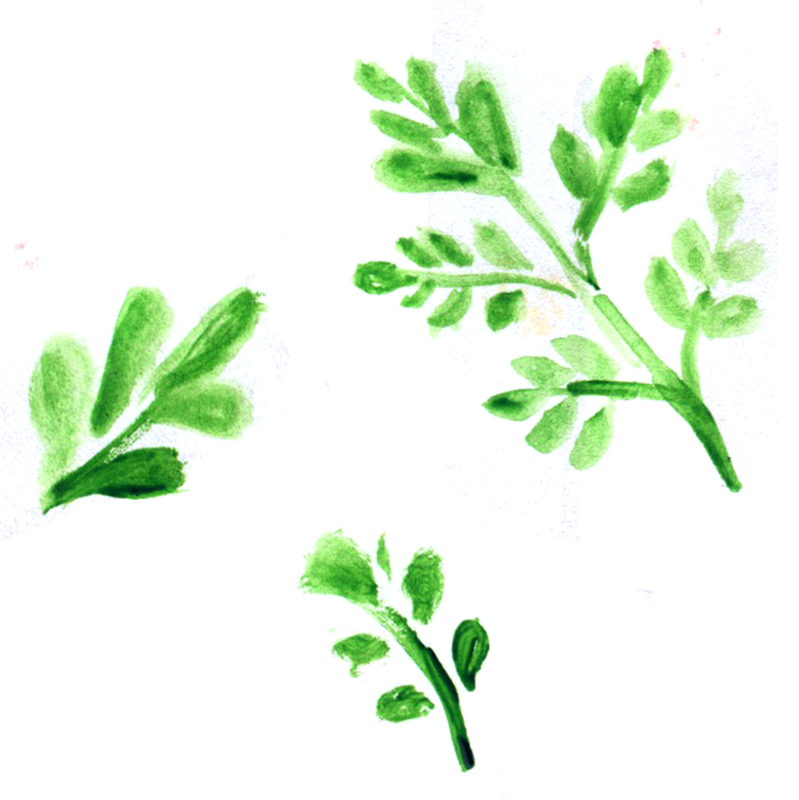 Garnish shakshuka with parsley or cilantro, and feta if using. Serve with pitas, for dipping.